Image taken on March 29, 1996. 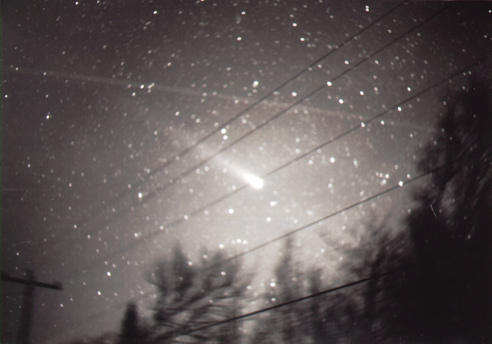 The light trail above comet Hyakutake has been left by the Space shuttle mission STS-76 spacecraft and the Mir space station. This has been confirmed by computation using the Keplerian elements for both spacecraft. The spacecraft were not docked and followed each other and the apparent angular distance between both of them was about the size of the Big Dipper.